Dissident Syrian Alawite scientist Monzer Makhous was designated today to take on the role of ambassador to France. “I received this morning Mr. Moaz al-Khatib, President of the Syrian National Coalition, which for us is the sole legitimate representative of the Syrian people. We discussed the manner in which this Coalition will get organized to ensure not only its legitimacy but also its credibility. “The Coalition president confirmed to us that there is not only the resolve to bring together all components of the Syrian people -- which was already well underway -- but also to set up a centralized, Cairo-based organization to channel all the humanitarian assistance the Syrians expect. “There will also be an integrated military command so that the Syrians themselves can secure the liberation of their territory in a coherent way. “France recalled its eagerness for a swift solution – a solution starting with a political transition. This is why we have taken -- I took -- the decision to recognize the Coalition as the legitimate representative of the Syrian people. I even added an appendix – namely, that there will be an ambassador of Syria to France to be designated by the Coalition president. “I also directed Foreign Minister Laurent Fabius, starting with Monday’s meeting of the European Union foreign ministers, to keep lobbying so that the recognition France has already made be followed by declarations in the same vein from other European countries and the EU. “Remains the question of the arms embargo. I won’t overlook the importance of this issue, which is [to reconcile] the Syrians’ need for military resources with the international community’s quest for controls. Accordingly, this discussion will likewise take place within the European Union, where the foreign ministers can make the best arrangements. “Lastly, France will continue to provide direct humanitarian aid, particularly to the liberated areas, in close collaboration with the Syrian National Coalition. “It was very important to have had this contact today to simultaneously demonstrate our confidence in Syria’s future government and mobilize our efforts so that this situation, which has lasted too long, can come to an end, a democratic end. “I made sure all Syria’s components are represented. Here gain, the Coalition president gave me all the pledges, particularly the presence of Christians and Alawites in the future configuration of democratic Syria. “I thank him for coming and I promise him France’s total support for a paramount cause, the cause of liberty." Khatib later said Monzer Makhous would take on the role of ambassador to France. Makhous earlier served as coordinator of external relations in Western Europe for the Syrian National Council, which is now part of the newly formed National Coalition of Syrian Revolutionary and Opposition Forces. Makhous’ Carnegie profile shows he is a member of the National Bloc, one of the founding coalitions within the SNC, and a member of the Committee of March 15 for Democratic Change, formed in May 2011. 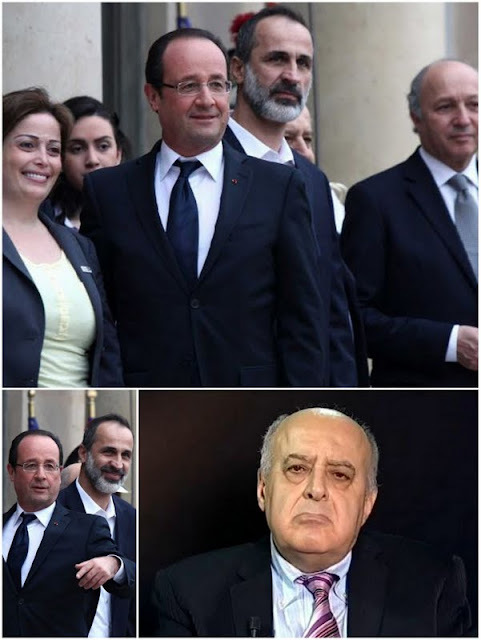 He is also a representative of the Alawite opposition abroad. Born in Latakia in 1946, Makhous has an engineering degree and an M.Sc. in geochemistry (1969), a Ph.D. in geochemistry and mineral resources (1974), and a doctor of science degree in petroleum production (1993) from Moscow State University. He has been involved in geochemical research since 1969, first in the Middle East then in the Sahel, and has been teaching at the University of Pierre and Marie Curie in Paris since the 1990s. “The fact Alawites have never been able to voice their anger at the regime is not because they supported it but because they have been suppressed for more than 40 years,” Makhous told Alarabiya TV’s “Point of Order” program last December. “The majority of the Syrian people managed to rise above sectarian differences and realized the best protection for minorities is the establishment of a pluralistic, democratic regime based on the principles of citizenship and equality before the law,” he said.